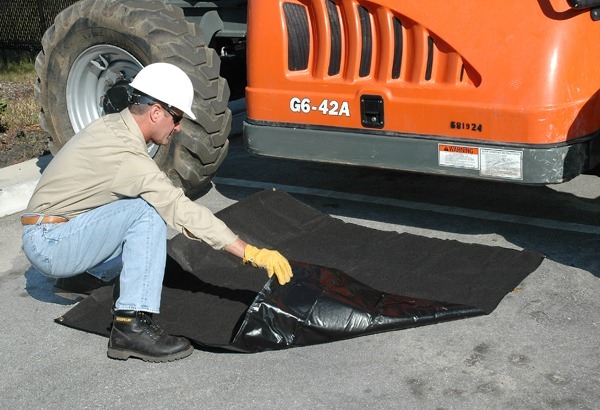 Ultra-Absorbent Tarp is used Under Machinery And Equipment To Catch Fluid Leaks During Maintenance Or Repairs. Rolls Or Folds Into Small Package-Store In Vehicles For Onsite Repairs. Keeps Floors Free Of Oily Mess-Reduces Slip Hazards. Three-Layer System Provides Maximum Protection. Top Layer: UV Resistant Geotextile Fabric-Allows Oils To Pass Through. Middle layer: Absorbent Core-Oil-Only Polypropylene Traps Oils But Allows Stormwater To Evaporate. Botton Layer: Impermeable Backing Keeps Drips From Leaching Through To The Ground Or Shop Floor. Dimensions: 10′ X 10′; Weight 12 Lbs. ; Capacity: Up To 12 Gallons.